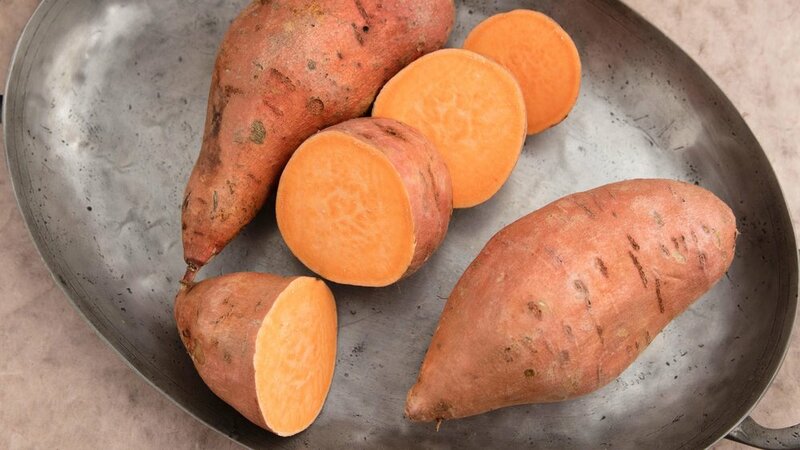 One of the healthiest food options out there is sweet potatoes. Not only do nutritionists believe they are good for you, but from their name, you can tell that they are starch superfoods! Additionally, the fact that sweet potatoes are appealing makes them a hearty dish to have in one’s diet. Plus the great thing is that you can eat them together with different stews and soups all year long. Moreover, there is also a myriad of health benefits you can get from including sweet potatoes in your diet. Here are 6 of the most common health benefits. Did you know that a single cup of sweet potatoes provides more than half the daily recommendation of Vitamin C that you need? Impressively, the same amount provides a whopping 400% of the intake that you require for Vitamin A on a daily basis. That’s great news for you. Primarily because the two nutrients are vital when it comes to effective immune functioning, especially during the flu and cold season. Additionally, Vitamin A is essential when it comes to the flu and cold season. As a matter of fact, it is key for the healthy maintenance of organ function, vision, as well as healthy skin. Apart from being a great source of Vitamins A and C, a cup of sweet potato also provides one-third of your daily recommendation of manganese. As you know, manganese is essential in the promotion of healthy bones and skin. It also essential in the production of collagen. Moreover, one serving of sweet potatoes provides about 30% of all the essential B minerals and vitamins, as well as potassium. Another major benefit of Vitamin C is that it serves as an antioxidant, thus helping to protect individuals against the effects of disease and aging. That being said, if you’re looking for greater effects of antioxidant properties, you need purple sweet potatoes. That’s because the pigment that provides these potatoes with that purple color contains a large concentration of antioxidant properties. For years, scientists have known that if low-point inflammation is left unchecked, it leads to the rise of nearly every imaginable chronic disease out there. These include the likes of heart disease, type 2 diabetes, cancer, and obesity. That being said, the presence of natural anti-inflammatory compounds traced in sweet potatoes has been shown to greatly reduce the effects of inflammation. As a matter of fact, tests carried out on animals has been found to minimize the effects of inflammation in the brain tissue, as well as the nerve tissue after consumption. 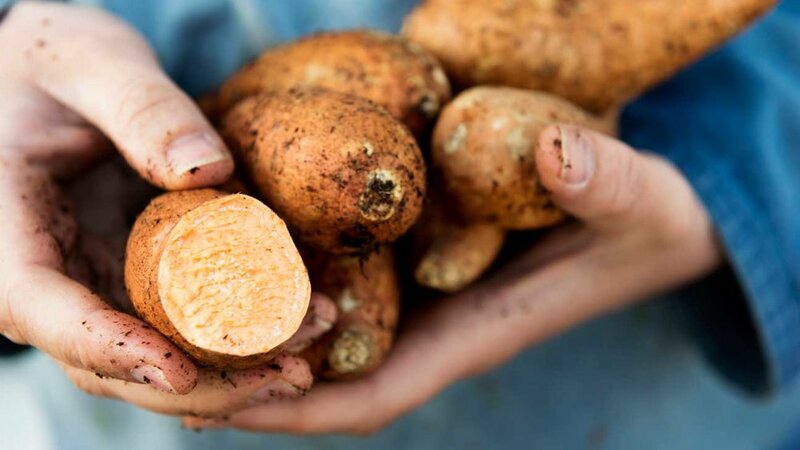 Despite being starchy in nature, the high fiber presence in sweet potatoes does not result in an increase in insulin levels, as well as a spike in blood sugar levels. In fact, they are a slow-burning starch. Which means that you can get your daily recommended intake of starch without suffering from the effects of high insulin levels. 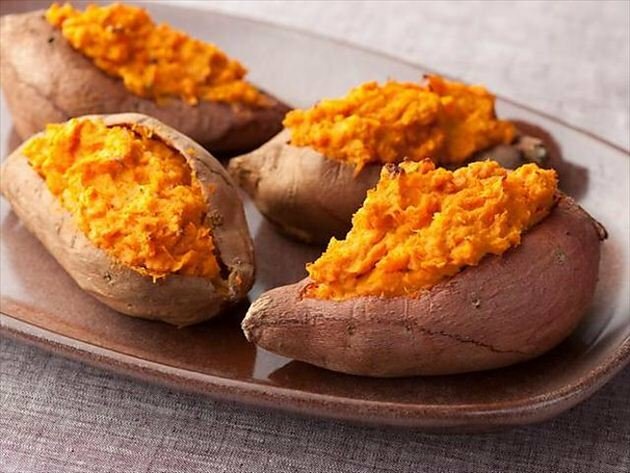 Did you know that a single cup of baked sweet potatoes provides about 900mg of potassium? As a matter of fact, this potassium concentration is higher than that gotten from consuming a medium banana. The benefits of potassium are endless. One of them is that it helps eliminate the excess concentration of fluid and potassium from the body. This, in turn, lowers blood pressure, reducing any strenuous effects to the heart. Additionally, potassium is important in regulating muscle contractions and controlling heart-rhythm. 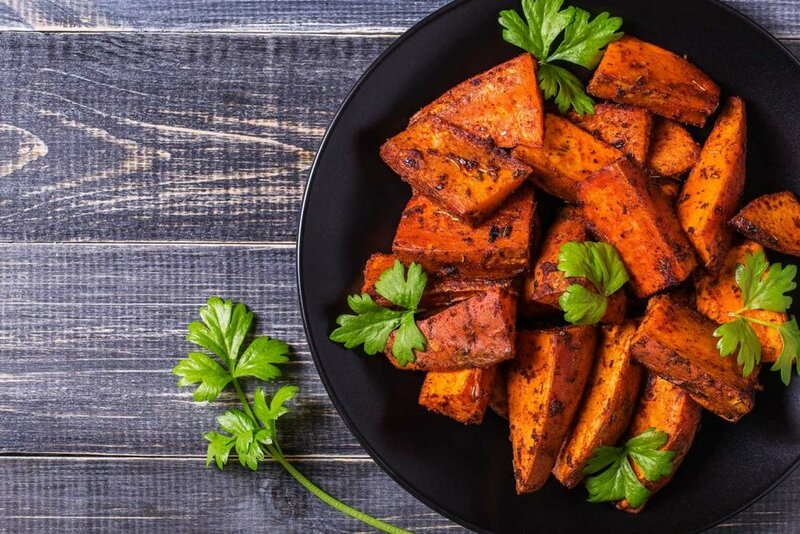 As a matter of fact, as from the results collected from the National Health and Nutrition Examination Survey, it showed that fewer than 2% of Americans get the recommended nutritional uptake of Potassium which is 47000 mg.
Last but not least, sweet potatoes are important in any weight loss regimen as the type of starch contained in them (about 12%) is resistant starch, which is quite filling. However, your body neither absorbs nor digests it. Additionally, one study discovered that replacing only 5.4% of your carbohydrate intake with resistant starch was found to increase fat burning after a meal by 30%. Moreover, resistant starch also results in the pumping of satiating hormones throughout the bloodstream.